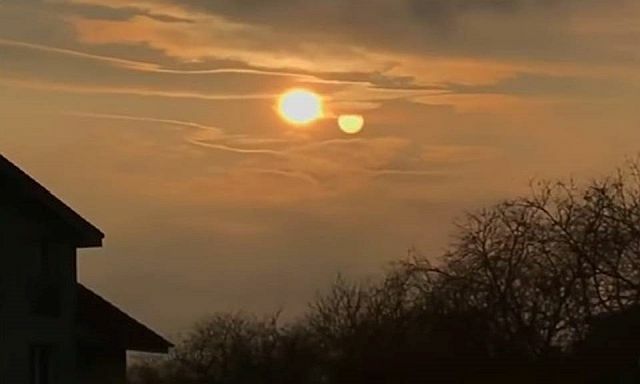 A strange sky phenomenon what is referred to as a second sun has been filmed again. This time the phenomenon appeared in the sky over Slovakia, Bratislava on January 23, 2017 and again on February 2, 2017. A "second sun" continues to be recorded by witnesses throughout the world as well as on astronomy observatory webcams, along with NASA's own satellite photos. NASA insists in public statements that a ‘second sun’ does not exist and is therefore no threat, yet they are warning their own staff to make preparations. The concept of a "second sun" is often used to refer to a large unknown planetary object or an advanced unknown planet like Nibiru which is mentioned in history books. Nibiru is Marduk's star. Marduk as the ruler of the cosmos made Nibiru visible and set it on his course wherein Nibiru passes by earth every 3,600 years allowing allows its sentient inhabitants to interact with humanity as defined in tablet 5 of the creation epic Enûma Eliš and described on a complete cuneiform tablet. Whether Nibiru is a legend or not, reports of a "second sun" in the sky continue to come in. Nope, you are incorrect. The second sun is 'behind' the clouds. Sorry, reflections do not do that you are 100% wrong. clear doublglassed.if we could see this in HD video it would be better to see the shape of the clouds as passing in front of this object and sun.